Segregated school located along the North Fork of the Blackwater that served Coketon, center of coal and coke empire of H. G. Davis. In 1892 teacher Carrie Williams, represented by J. R. Clifford, state’s first African Amerian lawyer, sued when county reduced school’s term. She won equal pay and terms for black students in WV. School closed in 1954. Erected 2011 by Tucker County Historical Society & Friends of Blackwater; West Virginia Archives and History. Location. 39° 8.518′ N, 79° 30.386′ W. Marker is in Thomas, West Virginia, in Tucker County. Marker is on Douglas Road / Front Street (County Route 27) half a mile south of Appalachian Highway (West Virginia Route 32), on the left when traveling south. Touch for map. Marker is just a few feet inside the Thomas city limits. Coketon is two miles further south on Douglas Road. Marker is in this post office area: Thomas WV 26292, United States of America. Touch for directions. Adjacent to the marker. 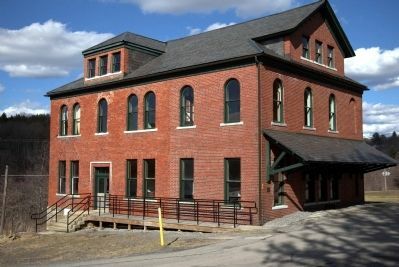 Today the building houses the Buxton and Landstreet Gallery and Studios. 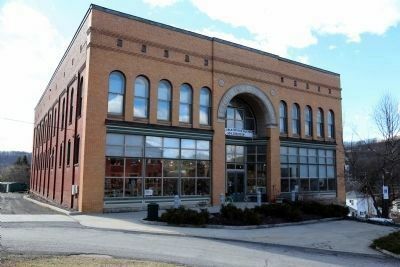 It was built around 1900 as a general store for Thomas and the surrounding communities. (approx. 3.3 miles away); a different marker also named Fairfax Stone (approx. 3.8 miles away); Hoye - Crest (approx. 6.7 miles away in Maryland); Corrick's Ford Battle (approx. 9.8 miles away); Tucker County Courthouse (approx. 9.8 miles away); Williams v. Board of Education Case (approx. 9.8 miles away). Touch for a list and map of all markers in Thomas. More about this marker. This historical marker is in the median of a turning circle in front of the former Buxton and Landstreet store. On the east side of this circle is the Davis Coal and Coke Company (DC&C) Administration Building, The DC&C building, lastly a Western Maryland Railway Office, is on the National Register of Historic Places. Related marker. Click here for another marker that is related to this marker. There is more detailed information on the lawsuit on this other marker's page. Adjacent to the marker. Owned by the city of Thomas and currently being restored. More. 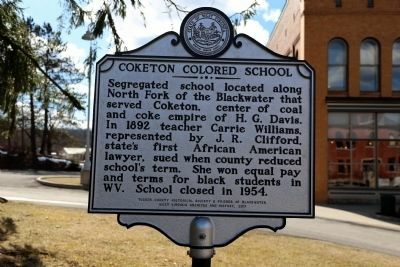 Search the internet for Coketon Colored School. Credits. This page was last revised on June 16, 2016. This page originally submitted on April 3, 2015, by J. J. Prats of Powell, Ohio. This page has been viewed 383 times since then and 11 times this year. Photos: 1, 2, 3. submitted on April 3, 2015, by J. J. Prats of Powell, Ohio. Editor’s want-list for this marker. Wide shot of the marker, showing its surroundings. • Photo of the school, or the lot where it stood. • Can you help?